4 Considerations for Choosing a Patio Railing - Mills Fence Co. Choosing a Railing for your Patio | Mills Fence Co. 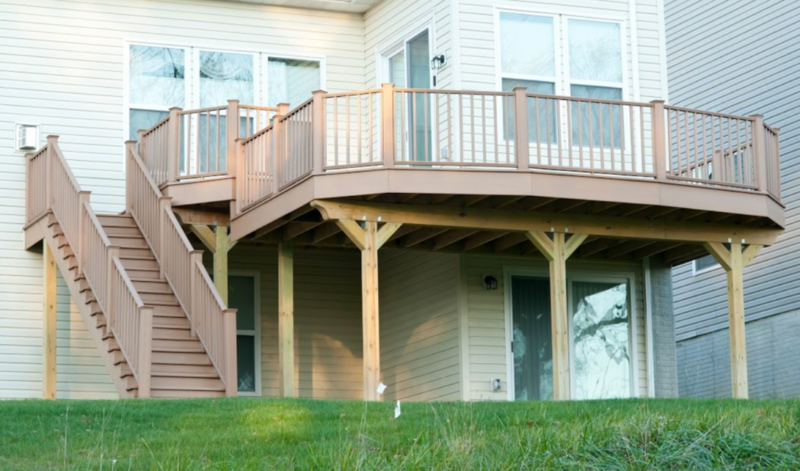 If you have a deck, a railing is a necessity for safety. With patios, you might choose to leave the space freeform, or you could incorporate a railing to delineate the space. Either way, the railing you choose for your deck or patio will have a significant impact both in its usage and overall appearance. Below are some tips to help you choose a deck or patio railing you’ll love. Part of the goal of any outdoor project is to keep the appearance cohesive with your house’s façade. Certain deck materials and styles provide a more cohesive look with some house styles. For example, old-world or otherwise historic styles of houses will call for traditional materials such as wood or wrought iron. Modern houses, on the other hand, lend themselves to manufactured materials, such as glass and sleek profiles. If you’re unsure how to match a railing to your house style, look at pictures of other houses in your preferred style. Chances are you’ll be drawn to one of the looks. Many home styles look good with a wooden railing, unless said railing gets too weathered. Because the railing takes up a lot of visual space related to your deck or patio, a weathered railing will make the space look tired. You can get the look of wood with other materials that don’t weather. In fact, one of the most popular materials for railings is vinyl. And manufacturers have worked a long time to make vinyl look like wood with its graining and overall profile. Vinyl doesn’t need to be painted or stained – it comes from the factory already finished. Composite rails are a version of vinyl railing. With composite rails, the posts consist of a wood core covered in a PVC sleeve; the panels are made of PVC. Composite rail systems tend to come in a wide variety of styles, so you can simulate the custom look of a hand-build wooden rail. Metal is the other common material for deck and patio railings. Indeed, metal is almost the only choice for a modern house. You might choose a traditional style with minimalistic pickets and posts. Another option is to replace the pickets with a glass panel, which offers a very mod appeal. Cable rails can integrate into several styles, from modern to traditional. The rails themselves are the metal portion – they usually span between wooden or composite posts. That said, you could choose metal posts for an ultra-contemporary look. For traditional styles, the goal is to simulate wrought iron, which is a high-end material. Typically, contractors use a prefabricated aluminum kit that’s been molded to resemble wrought iron. You usually have different options for the panels and posts so you can simulate the wrought look of such railing. In that vein, whether you choose a wood-look or metal railings, you’ll have some choices in ornamentation. However, minimalism is a central tenet of the modern style, so if that’s your chosen look, stay away from ornamentation. With wood-look railings, many of your ornamentation choices come in the posts, specifically the caps. Most manufacturers offer a wide range of post caps with different style profiles ranging from simple to elaborate. Likewise, you can choose to incorporate lighting under the caps. You can also look into carved pickets in the railing panel. With metal railings, you have a lot more ornamentation options. A popular choice is the double top rail, which adds visual interest. You can even choose panels with rings between the double rails. Since the railings are meant to simulate wrought iron, you often have different finial options too, such as spear pickets or hoops and spears. Choose a railing style that complements both your house and your personal taste. Mills Fence Co. can help you choose and install a complimentary deck or patio railing system.